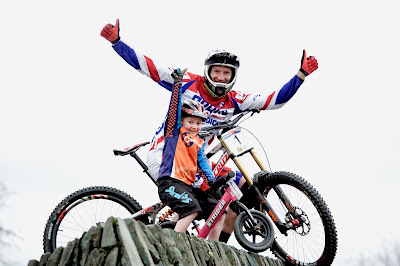 Former Downhill World Champion and mountain bike legend, Steve Peat, has recently been in Glasgow to launch the Fort William stage of the 2016 UCI Mountain Bike World Cup, set to be his last competitive appearance at the event. The fan favourite, known on the circuit as ‘Peaty’, is retiring from World Cup racing at the end of the current downhill season following a career spanning 20 years and including 17 World Cup wins, 52 World Cup podiums and one World Championship. This year’s Fort William Mountain Bike World Cup and BUFF® 4X Pro Tour will take place over the weekend of 4 and 5 June and promises to be more exciting than ever. Work is underway to add new technical features and jumps to the infamous 2.8km downhill course, while a host of attractions will be on offer to keep fans entertained. As he prepares for his final World Cup event in front of a home crowd, the 41-year-old rider from Sheffield was joined in Glasgow by up and coming young riders to announce tickets going on sale. He said: “Competing at the Fort William World Cup has always meant a lot to me and it will be an emotional day saying goodbye to the fans and riders for the very last time. 200 of the sport’s biggest stars, including 2015 World Champions, British rider Rachel Atherton, and France’s Loic Bruni, will be competing as they race against the clock down the slopes of Anoch Mor. Alongside the downhill action, famous trials rider and YouTube record breaker Danny MacAskill will also be in attendance over the weekend with his Drop and Roll Street Trials team. The Red Bull athlete will be wowing the crowds with an array of tricks, which has seen the Scotsman build a huge fan base across the world. Event organiser, Mike Jardine, from Rare Management, said: “The two-day event is a huge celebration in which riders and fans come together in a family friendly atmosphere for the only UK leg on the World Cup circuit. Over a quarter of a million fans have descended on Fort William since the UCI Mountain Bike World Cup came to the Highlands 14 years ago, delivering a £30m boost to the Highland economy since 2002. The event, which is supported by EventScotland and Highland Council, is the third stage on the UCI World Cup Downhill calendar which kicked-off in Lourdes last weekend. It was recently named as the number one mountain biking event to attend in 2016 in a Red Bull Top 10 list. Paul Bush OBE, VisitScotland’s Director of Events, said: “We have supported the UCI Mountain Bike World Cup for many years now and are looking forward to the 2016 event as much as ever. Prices remain unchanged from last year’s event, with tickets costing from £14 for adults and £8 for children aged 6 – 17 years old. Family packages are also available starting from £36. For more details on the event and to buy tickets, visit www.fortwilliamworldcup.co.uk.